students on their winning entries for the "What Would Martin Say" Essay and Elocution Contest. These students will receive awards and prizes supplied by IT&E, MegaByte and Hollywood Theaters, as well as cash prizes! in the community is invited to attend. and American Memorial park for their generous support. on Monday January 19, 2009 beginning at 1:00pm. MLK Day Jan 19: Celebration DINNER at Bud's Bar! You are invited to join us in our “Fulfilling the Dream” Inaugural Celebration Dinner to be held on January 21, 2009 from 6pm until 8pm. Proceeds will be used for the AACPC educational and youth program activities. The occasion of the Inaugural Celebration of Barack Obama as President of the United States of America and the commemoration of the 2009 national holiday for Dr. Martin Luther King Jr., presents a unique opportunity for us as a community to unite in the spirit of “Fulfilling the Dream” envisioned by Dr. King. Tickets may be purchased from committee members for $15 which includes dinner/buffet and entertainment. Mouth-watering soul food items will be presented by Chef Sean Thompson from his southern recipes, including, among others, black eyed peas, ham hocks, greens & cornbread, chitterlings and candied yams. Please indicate the number of tickets you would like to purchase below. SAIPAN-As an eight-year old girl at the close of World War II, MarshaRose Joyner--daughter of a military father stationed on Saipan--has fond memories of climbing the fence around the Camp Susupe Detention Center, and sneaking in to play with the Chamorro children living within the compound. On January 19, 2009, Ms. Joyner returns to Saipan for the first time since 1949, to deliver a special keynote address for the third annual MLK Day Commemoration organized by Saipan's African American Cultural Preservation Committee, Inc. (AACPC) with support by the Northern Marianas Council for the Humanities. Ms. Joyner's connection to Pacific region is a unique one. MarshaRose's father—Marshall Hood—a sergeant in the US army was assigned to an ordnance unit (recovering unexploded bombs, equipment etc.) after the battle of Saipan. In 1946, after traveling on military orders with her mother cross-country by train from Maryland to California, then by steamship to Hawaii, then by seaplane to Guam--where they reunited with her dad--the family journeyed to Saipan where they stayed until 1949. Even at that young age, the experience had a profound effect on her. Having lived and experienced her memorable US-to-Pacific Island journey during the "Jim Crow" era in the US, where white racism was law, she was witness to, and victim of one brand of prejudice and segregation. Then, on Saipan, she witnessed another form of segregation and discrimination at Camp Susupe. 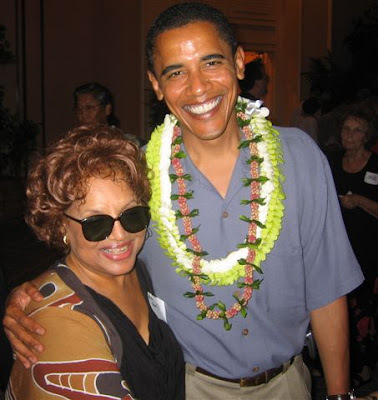 She went on to be an activist for many civil rights causes, accumulating many honors and accomplishments, and then returning to Hawaii in 1970, where she currently resides. (excerpt from her memoirs will be available online ). She is an advocate of indigenous rights as Project Director for the Pacific Justice and Reconciliation Center. This wife, mother, grandmother and cancer survivor says of her life's purpose, "I see my role in life as a grain of sand. To make a truly beautiful pearl there must be a grain of sand in the oyster. To make a truly beautiful world . . . there must be people like me . . .the irritants that keep everything growing". As part of this year's upcoming MLK commemorative activities in the CNMI, (this year's theme: Color of Unity, the Pacific Way) she will be sharing her lifelong perspectives on the significance of Martin Luther King, the Civil Rights Movement, and its impact on the people and way of life here in the Pacific. Plans are for Ms. Joyner to conduct workshops on Saipan, Tinian, and Rota. She will be arriving on Saipan on Tuesda, January 13 at 8:50pm. (All are welcome to come out to greet her at the airport; use contact number below first as some items in schedule are subject to change). The MLK Day event, mini-march, forum, essay finalist performances, and keynote address will take place on Monday, January 19, 2009 at American Memorial Park beginning with a public forum at 1:00pm. All are invited to attend and participate. Monday, January 19, 2009 marks the 3rd official Commemoration of Martin Luther King Day since Governor Benigno Fitial signed the bill enacting Martin Luther King Jr. Day as an official CNMI holiday. Details may be found on BlacksOnSaipan.com. Contact Joe Hill at 670 234-6806.